Don't knock it til you nuke it. Me thinks molten chocolate cake has finally jumped the shark by becoming Mug Cake. I do wonder when I still see Molten Chocolate cake on dessert menus. Has the molten cake not had its day pastry people? At least mix it up a little. How about molten on the outside, cake on the inside! Wait, that’s chocolate cake with sauce. OK. It’s over. Or is it? 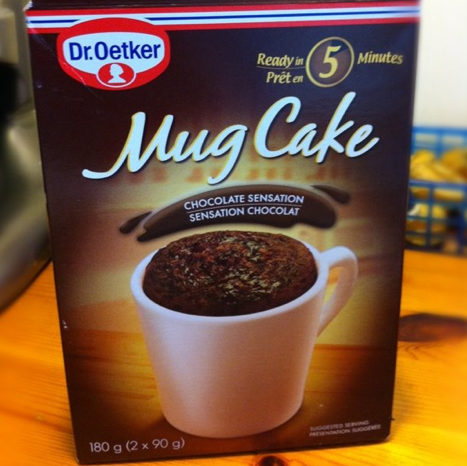 A little Dr. Oetker Mug Cake made its way into my house recently. Did I raise my inner foodie eyebrow? Oh yes, I did. But, forging ahead with an open mind and open cupboard, I pulled out a mug and did some baking. Using my 10-year-old, not so high-powered microwave, after a couple minutes I pulled out a moist, chocolate cake in a mug—kind of goopy in the centre where it hadn’t finished cooking. You bet I ate the whole thing. And then I really opened my mind to the universe and thought, Who’s to say you couldn’t pour a little Drambuie on this baby and flambé it up? Just call it Flug Cake. And since I’m on a drunken roll, here’s another great idea: Mug cake for high tea! Watch the Royal nuptials while sipping a mug of warm cake. Just call it Smug Cake. Why does everyone get so down on molten chocolate cakes? They are delicious, when done right. As for the argument that “the time has passed,” ice cream has been around for hundreds of years. I don’t think anyone turns their nose up at ice cream. And if they do, I don’t want to know them. Vic-I feel like I have offended the original molten cake integrity. This may just start some controversy…but I did not know that MCC comes with Domino’s pizza. I feel a dinner plan coming on. Put more things in a mug. Molten and beyond. This has given me the urge to bake some pillow cookies. Brownies covered in chocolate chip cookie dough. Wonder if you could do those in a mug?